The appendix is not restricted to Pascal. It contains general advice and suggestions as well as overviews of topics such as networking that are demonstrated by many programs and tutorial sections on the site. This is only the start of what might turn out to be a large section, and we invite suggestions from students for topics and tips to include. We begin with a few very general tips. Save work in at least two independent locations. (By Sod's Law your best work will, like some fine code we have been shown, be lost forever). Although spaces are allowed in filenames and folder names, they cause problems with some software. (Even the Command Prompt in Windows 8.1 the command C:\Program Files\Internet Explorer\iexplore.exe fails and quotes are required for success in opening IE: "C:\Program Files\Internet Explorer\iexplore.exe". Learning a few keyboard shortcuts can save you a lot of time over the years. We provide examples below. See Microsoft Support for documentation of shortcuts. We list some particularly useful examples here. See equivalent commands in DOS (within Windows) and Linux. You can perform many tasks more efficiently from the Windows Command Prompt. To copy text in quick edit mode simply select the text then press Enter or right-click. To paste from the clipboard, position the cursor over the Command Prompt window then right-click. To enable quick edit mode select the menu item properties then the Options tab and check the QuickEdit Mode checkbox. It is usually most convenient to change directory to a certain folder (e.g. by typing cd C:\Working) so that you do not need to prepend each filename with its path. Keep in a text file commands that are long and/or difficult to remember so that you can copy them and paste at the command prompt. To change drive just type for example G: (omitting cd). Your code is easier to read and more impressive with syntax highlighting. Plugins are available for many editors. In Notepad++, select menu item Plugins > NppExport > Export to RTF or Plugins > NppExport > Export to HTML. You might like to use an online syntax highlighter. As with syntax highlighting, well-formatted code is easier to read. We use an indent of only two spaces so that deeply nested constructs usually fit onto a single line on the web page. You can format as you code or use a "pretty printer" afterwards. In Lazarus you can select menu option Source > JEDI Code Format > Current Editor Window (or use the convenient shortcut CTRL+D which also works in Visual Studio). 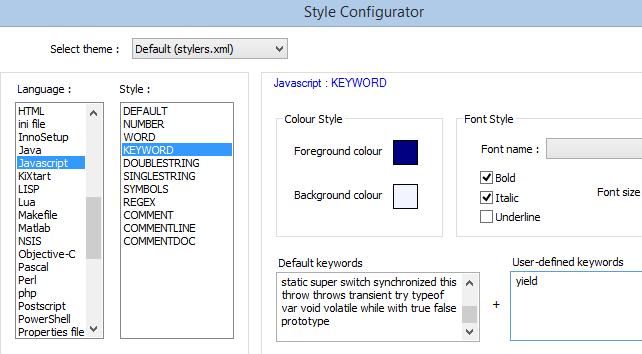 You can customise the automatic formatting in Lazarus by selecting menu option Source > JEDI Code Format > Format Settings. Select Format File in the IDE Options window to see the filepath of the XML file of settings. You can change settings either by checking boxes within IDE Options or by editing the XML file directly. Correct formatting is crucial in Python. Mistakes in your formatting may be result in error messages from the Python interpreter. Chrome is our favourite web browser overall. It is quick, reliable, good for copying and pasting code from web pages and has great tools for developers. Safari is special in allowing you to see unsigned applets without any warnings. CTRL+ H: Browsing history. In Internet Explorer pages visited are conveniently sorted by website. Tip for searching: include the second-level domain (SLD) of the website in a of a website without an inbuilt search facility. For example, a search for pp4s quicksort works well for our site. (We feel that our hand-crafted indexes such as General Pascal Index and Index of Pascal Routines are underused by visitors). We draw your attention to two developer tools in Chrome (an example of a fine browser). The interpreter is trying to evaluate expressions and if you do not provide it with a return value it gives you the error message "undefined". In the second (multi-line) example we used SHIFT+Enter to begin a new line (following the documentation). Usefully, you can use the up and down keys to navigate through previous commands. Also, you have intelligent code completion to help you to write acceptable code. The first tab (Elements) in Developer Tools allows you to see which CSS styles pertain and which have been overridden. You can change the styles to examine their effects. Here we use a colour picker to change the background colour of the table header in our introduction to the Resources section. If we had preferred the new style we could have copied the CSS code to our file jksdefault.css.